Let me preface this by saying that I live in Texas. Down here we grill chicken, brisket, sausage and turkey legs. Not pizza. 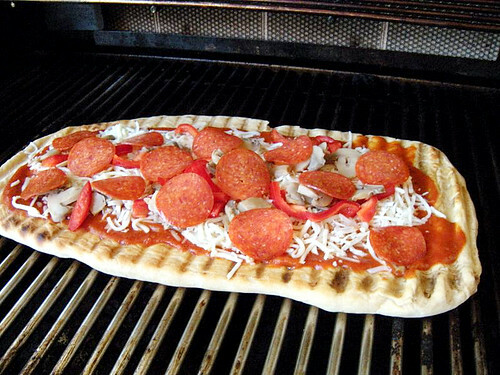 Grilling pizza is pretty damn unknown here. Well, even if it’s not, I’ll be bold enough to say that it is. Let’s pretend that I’m right. Also, it may be the tail-end of Summer where you are so grilling at this time might seem weird to you, but here it’s still Summer. Today’s high of 100F says so. Having cleared that up, I have never grilled a pizza. Ever. I had never even heard about it until I started blogging. But once I saw the idea and got past my “Texans only grill BBQ” mind set, I was so intrigued! And it’s taken far too long for me to take the leap. I’ve lost so many years of the best pizza I’ve ever made at home. But I’m hip to the jive now groovy people. Whoa, taking it back 1975. Bad blog writing aside, this really is the best pizza I’ve made. 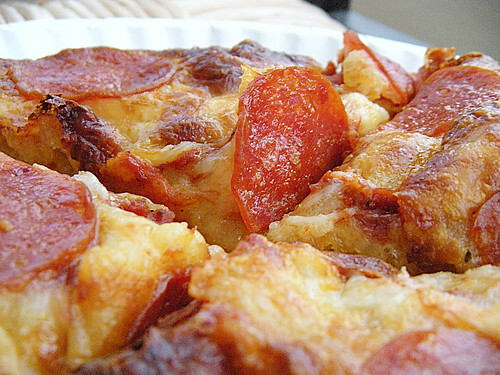 The outside of the crust is lightly crispy, the inside is fluffy and soft and once you have the pizza crust ready, it takes no more than 20 minutes, start to finish. It is so worth it. 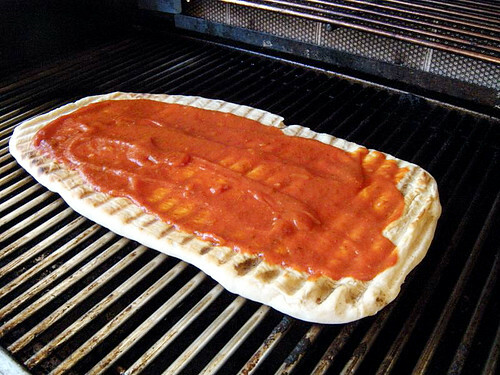 I used this pizza dough, pre-made sauce (I had to use what I had on hand) and a propane grill (although you can just as easily grill this on a charcoal grill.) 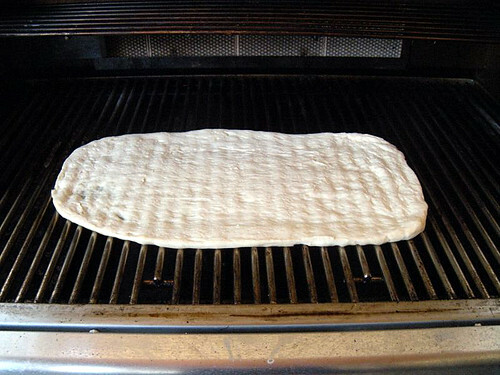 Have your pizza dough ready and made before proceeding to the grill. 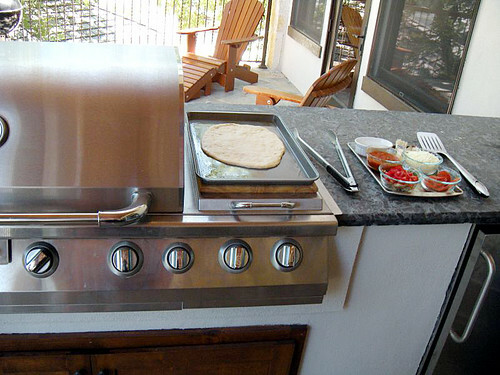 Preheat your grill to medium heat for about 10-15 minutes. 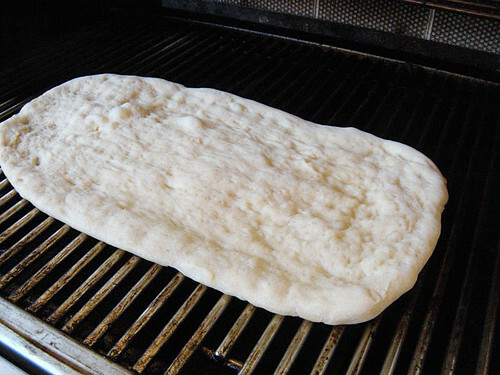 While the grill preheats, lightly grease a baking pan (with non-stick cooking spray or olive oil) and place your dough and shape it into an oval/rectangle shape. 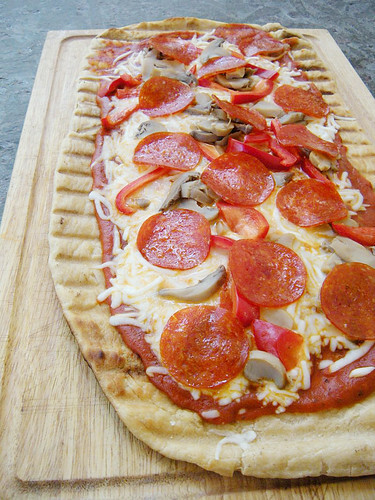 Grab another clean baking sheet for your finished pizza and stack it under your baking sheet holding the dough. 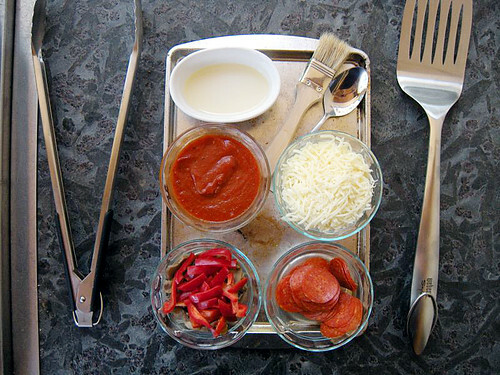 Gather all the toppings you intend to use (meats, veggies, cheeses, sauce, everything) in easily accessible bowls, a spoon, a brush, and tongs and place them on another tray. Time to head outside. 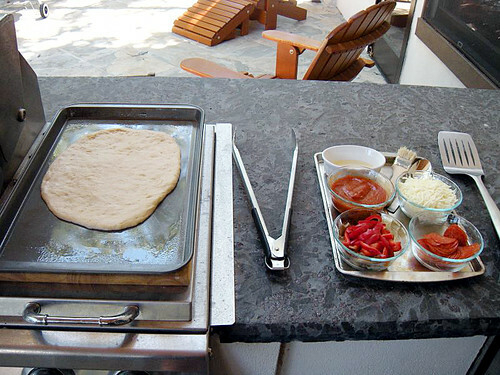 Place your tray(s) holding the dough on one side of the grill and place the toppings tray on the opposite side of the grill. Lightly brush the top side of dough with olive oil. 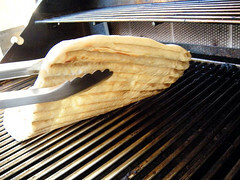 Open the grill, grab two edges of the dough and in one smooth motion lift the dough and quickly place it on your hot grill surface. The dough will be ready to flip when it lightly bubbles on the surface and the bottom has lovely grill marks but is NOT burned. 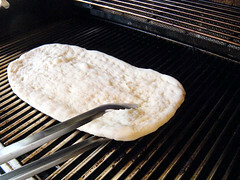 Using a pair of tongs, gently flip the dough over. Throughout this process, keep an eye on the grill’s temperature, adjusting up or down as necessary. Burned pizza doesn’t taste that good. 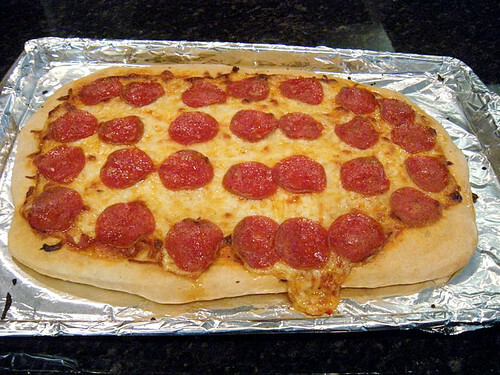 Now working quickly, using a spoon, spread your sauce over the crust. 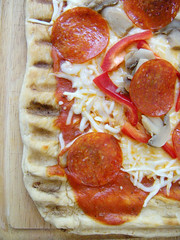 Next, layer with your toppings (mine were red bell pepper, mushrooms, pepperoni and mozzarella cheese). 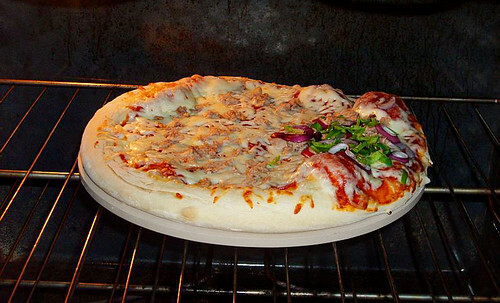 Once all your toppings are on the pizza, close the grill and let the pizza cook for 2-3 minutes to melt the cheese and finish cooking the crust. You might need to cook a bit longer depending on how much cheese you used but I would not recommend more than another minute or two. Sometimes there’s nothing better than sitting back, kicking up your feet, enjoying a slice of pizza, a beer and some football. Or whatever your television poison is: trashy reality, hockey, CSI version 95, or the weather channel. Either way, pizza is the answer. 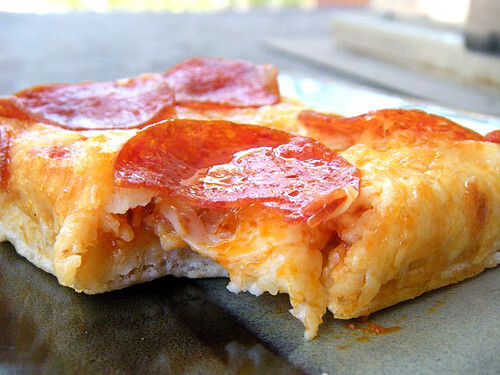 Made even better when your crust is infused with beer! Don’t fret, beer haters. I am not what you would call a ‘fan’ of beer. 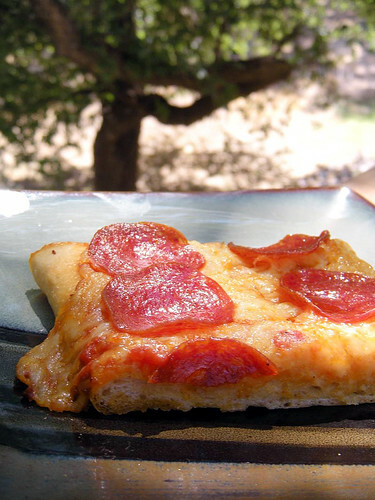 This pizza crust is mildly flavored, although it does depend on the type of beer you use. But if anything, the yeast in the beer gives this dough a beautiful rise and a wonderful flavor and texture. Almost like an artisan pizza crust. 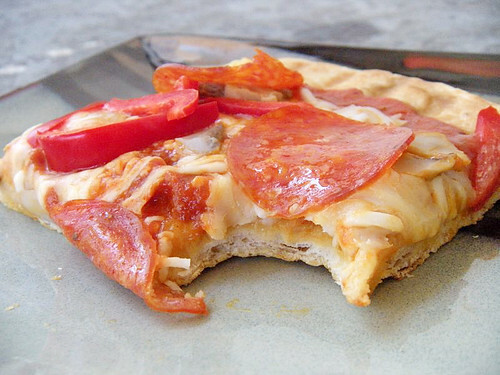 This pizza crust comes together so easily and you don’t even need a stand mixer for it. I made this dough using a big bowl, a wooden spoon and kneaded by hand and it was no trouble at all. I would easily say this crust is tied with my go-to pizza dough. That’s serious business people. 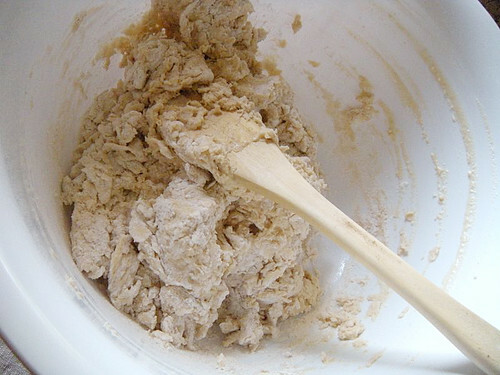 Combine flour, instant yeast, baking powder, salt and olive oil in a large mixing bowl with a whisk. Slowly add beer and using a wooden spoon, mix until you have a shaggy dough. Flour your hands and your dough and knead the dough with your hands until you have a soft, smooth dough – it should hardly stick to the mixing bowl or your hands, about 7 minutes (less if using a stand mixer). 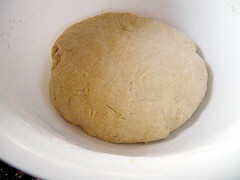 Form the dough into a round ball, cover with a dish cloth and allow it to rise for anywhere from 30 minutes to 2 hours. Once your dough is doubled in size, use your open hand to gently press down on the dough to deflate it. Separate into 2 dough balls or leave whole if making one large pizza. 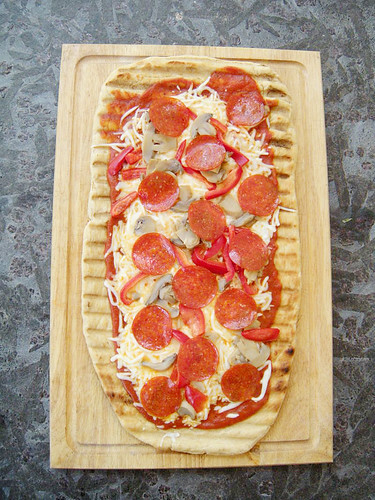 If you have a pizza stone, cover with parchment paper. If you don’t, use a large round or rectangular metal pan, cover in foil to make clean-up much easier and sprinkle with a little corn meal or lightly spray with cooking spray; set aside. Shape (or roll) your dough to about 10 – 12 inches (or to fit the size of your pan) keeping in mind that thin dough makes for a crispier crust and thicker will yield a softer, thicker crust. When you think it’s roughly the right size for your pan (or baking stone), turn the dough down onto it. You might need to let it rest for a few minutes and gently pull at the sides if you find the dough springs back. but the following commercial is about children being fed pre-made chicken nuggets (in which the ingredient list has a number of ingredients that I can’t even pronounce) like there’s no problem. What ever happened to REAL food? There is a homemade, real food alternative to every pre-made food out there. It may be a bit different but my thought process: if it’s homemade, it HAS to be better for you. I mean… it’s REAL food after all. Let’s start with pizza! 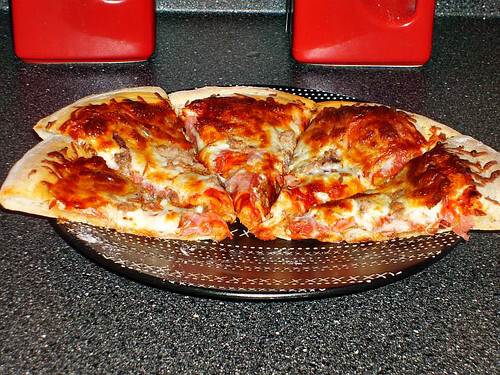 Yes, you can make pizza at home. And you can even healthify it by using whole wheat flour instead of white flour. And it’s simple!! Mix, knead, rise, knead, last rise while you chop your veggies and grate your cheese. Easy cheesey! Makes enough for one small, thin crust pizza. Double it if you like your pizza thick and bready. 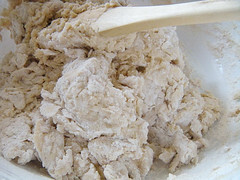 Stir dry ingredients, including yeast, in a large bowl. Add water and olive oil, stirring mixture into as close to a ball as you can. Dump all clumps and floury bits onto a lightly floured surface and knead everything into a homogeneous ball. Use flour when needed… it’s slightly sticky at this point. If you are finding this step difficult, simply pause. Leave the dough in a lightly-floured spot, put the empty bowl upside-down on top of it and come back in 2 to 5 minutes, at which point you will find the dough a lot more lovable. Knead it for just a minute or two. Lightly oil the bowl (a spritz of cooking spray perfectly does the trick) where you had mixed it — one-bowl recipe! — dump the dough in, turn it over so all sides are coated, cover it in plastic wrap and leave it undisturbed for an hour or two, until it has doubled in size. Dump it back on the floured counter and gently press the air out of the dough with the palm of your hands. Fold the piece into an approximate ball shape, and let it sit under that plastic wrap for 20 more minutes. 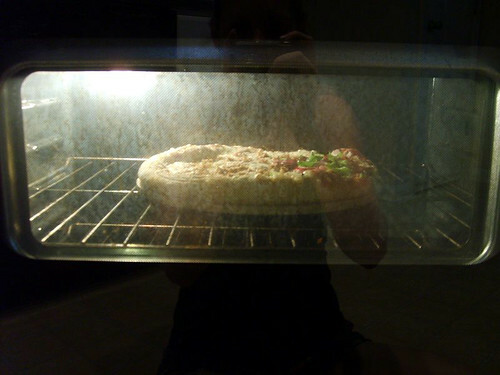 Sprinkle a pizza stone or baking sheet with cornmeal and preheat your oven to its top temperature. 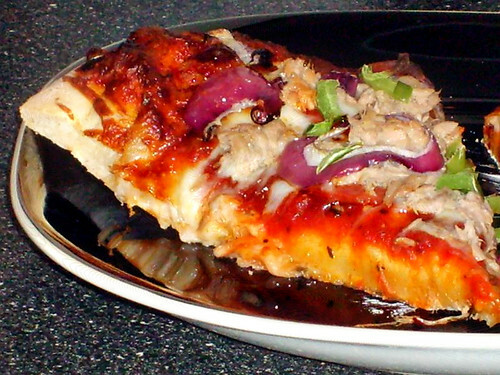 Roll out the pizza, toss on whatever topping and seasonings you like. 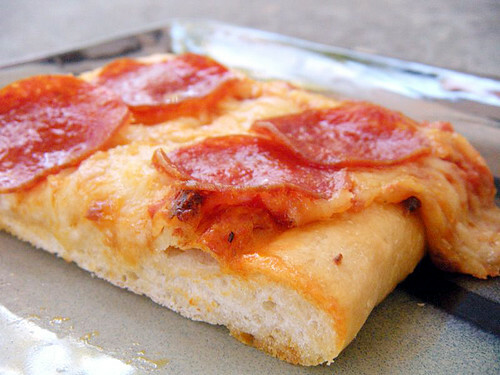 If you like a TON-o-toppings and bready crust, slice them thinly so you don’t weigh down the dough. Bake it for about 10-15 minutes until it’s lightly blistered and impossible to resist. Once upon a time, there was a girl who lived in a land of frozen pizzas. “Homemade pizza crust is just too daunting to make” she said as she skipped off to the store to buy a ready made pizza. Then, the baking gods shone upon her with a simple, delicious (did I mention simple?) 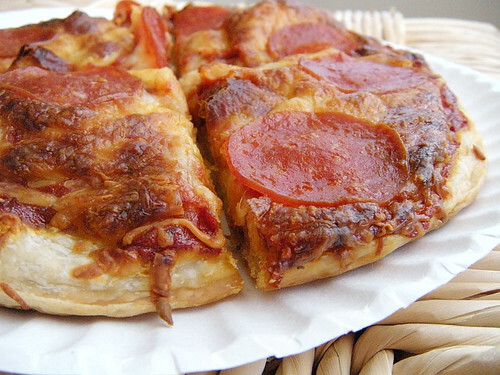 recipe for pizza crust! She read it over a few times and decided to go for it. I had my “AHA” moment with this crust. 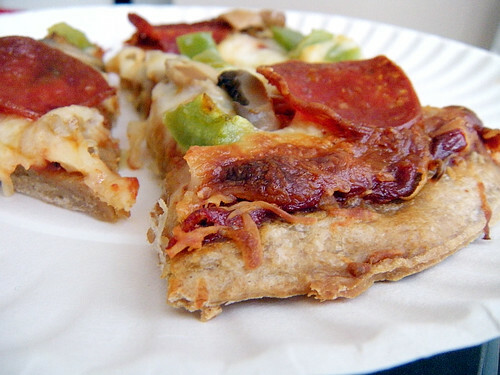 I KNOW that homemade tastes much better, I KNOW that its better for you because there are no preservatives, I KNOW that I can top the pizza with fresh delicious veggies instead of frozen ones, i know, I Know, I KNOW!!! 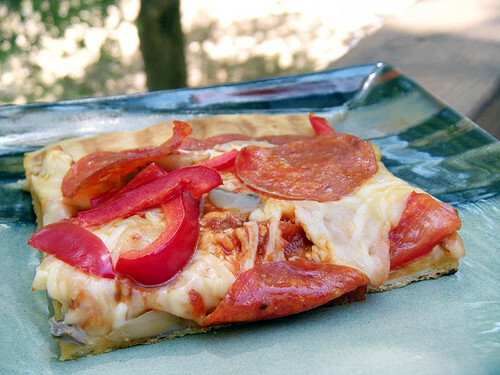 It’s quick and simple and delicious and customizable… its fantastic. If you’ve never made pizza dough before because it seemed too daunting or you were afraid of messing up the dough, use this recipe as your breakthrough. I'm Jeannette. Blonde. Fun. Easily Obsessed. Mover. Shaker. Hugger. Lover. I'm glad you're here. Won't you stay a while?